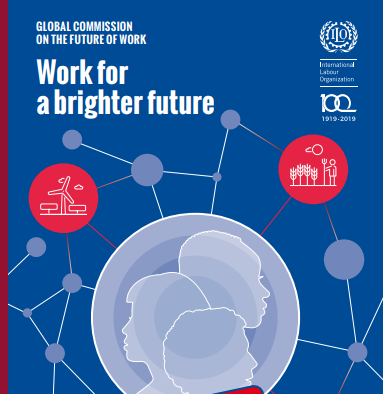 A landmark report by the International Labor Organization’s (ILO’s) Global Commission on the Future of Work, released today, calls for giving full rights and protections, including collective bargaining rights, to digital platform workers. The ILO is the United Nations agency charged with promoting decent work and global labor standards. A “universal labor guarantee” to ensure that all workers, regardless of whether they are treated as employees or independent contractors, enjoy fundamental worker rights such as the right to bargain collectively; an adequate living wage; maximum limits on working hours; freedom from forced labor, child labor and discrimination; and the protection of worker health and safety. Universal social protection—namely, universal health care, access to education, income support, unemployment compensation, workers’ compensation and disability and retirement benefits—for all workers in all forms of work, with governments supplementing a guaranteed minimum “social protection floor” with contributory social insurance programs. A global governance system for digital labor platforms to ensure decent work across international jurisdictions. According to the latest data from the Department of Labor, “electronically mediated work” currently accounts for 1% of the U.S. workforce. According to the latest research by the JPMorgan Chase Institute, digital labor platforms in the transportation sector currently account for 1% of the U.S. workforce, while digital labor platforms outside the transportation sector account for another 0.1%. While recognizing that rapid technological advances offer “remarkable opportunities” to promote good jobs and decent work, the commission maintains that we are now facing “one of the most important challenges of our times, as fundamental and disruptive changes in working life inherently affect our entire societies. Without decisive action, we will be sleepwalking into a world that widens inequality, increases uncertainty and reinforces exclusion, with destructive political, social and economic consequences.” While technological advances—such as artificial intelligence, automation and robotics—and the greening of the economy will create millions of new jobs, many jobs will disappear. A measurable agenda for gender equality, including gender-balanced parental leave; investment in public care services; stronger collective representation of women; the elimination of gender-based discrimination, including in the tech sector; pay transparency; and the elimination of violence and harassment at work. More worker sovereignty over working time through minimum hour guarantees; maximum limits on working time; flexible schedules; premium pay for on-call waiting time and for work that is not guaranteed; and the application of technology to achieve balance between work and personal life. Harness technology for decent work through collective bargaining over the design of work; a “human-in-command” approach to artificial intelligence to ensure that final decisions affecting work are taken by human beings rather than algorithms; regulation of the use of algorithmic management, surveillance and control of workers through sensors, wearables or other forms of monitoring; regulation of the use of worker data; and guaranteed access of workers to their own data. Reshape business incentives for long-term investment, including through policies to promote tax fairness; revised corporate accountability standards; and enhanced representation of social and community stakeholders. A universal entitlement to lifelong learning and skills training, including both informal and formal learning and training, from early childhood to adulthood. Public investment in good jobs, including strategic investment in high-quality physical, digital and social infrastructure; the care economy; the green economy; and the rural economy. Public investments to support people going through job transitions, including paid time off for training; quality apprenticeships; youth jobs programs; and the expansion of public employment services. Better measures of economic progress to account for the value of unpaid household work; environmental degradation; and the distributional and equity dimensions of economic growth. 190 million: The number of people in the world who are unemployed, of whom 64.8 million are young people. 344 million: The number of jobs that will need to be created by 2030 to address unemployment. 2.78 million: The number of people who die every year as a result of occupational accidents or work-related illnesses. 300 million: The number of workers in the world who live in extreme poverty. 1%: The percentage of the world’s population that received 27% of global income growth between 1980 and 2016, while the poorest 50% received only 12%. 36.1%: The percentage of the global workforce that works excessive hours. 20%: The gender pay gap, or the amount by which women are paid less than men. 53.6%: The percentage of households with internet access (only 15% in emerging countries). 2 billion: The number of people who make their living in the informal economy.